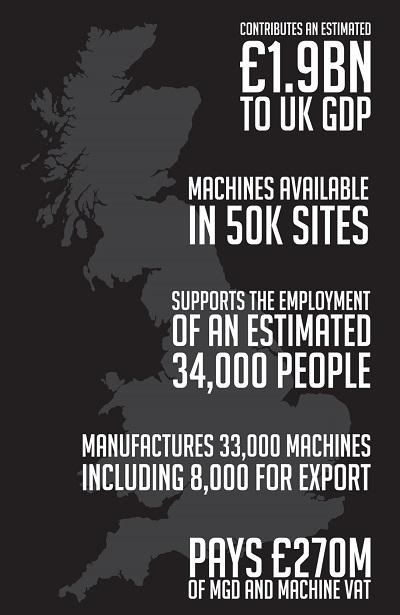 The UK amusement and low stakes gaming industry has a story to tell. And it’s not just one about hard working, community serving businesses – it’s also about the significant contribution the sector makes to the UK economy. In post-Brexit Britain, it’s industries such as those under the trade association Bacta’s umbrella that will be driving the economy forward on the front line. And with more than £270 million paid over by the industry each year in MGD and machine VAT alone, it’s a contribution worth taking seriously. 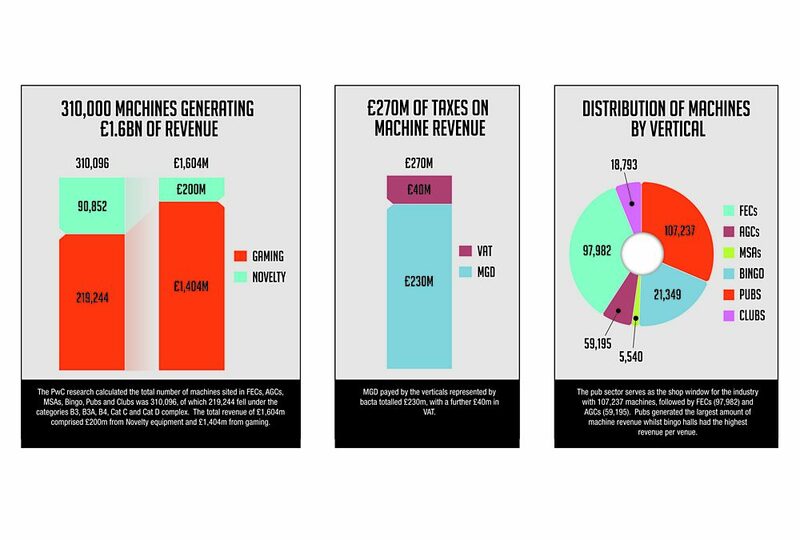 THE UK Amusements and low stake gaming industry contributes close to £2bn to UK GDP, supports the employment of 34,000 people and pays some £270m of MGD and machine VAT, according to the highlights of a body of economic impact research conducted by PricewaterhouseCoopers LLP (PwC) on behalf of Bacta. The purpose of the research was to provide a fact-base of insights and was undertaken in the period July to September 2015. The sources used include publically available data from gambling and other bodies including the Gambling Commission, H2 Gambling Capital, HMRC and Local Authority licensing returns database as well as interviews with industry players with businesses operating across the major industry verticals. To give some context to the figures, the £270m in MGD and machine VAT alone would be sufficient to purchase over 300 MRI Scanners (National Audit Office figures show the NHS has just 426). Using education as the funding benchmark, a secondary school which is built directly from scratch can cost anywhere from between £9m to £30m, depending on its size and geographical location. The total employment supported in the UK is calculated in a similar way and based on Input-Output modelling. The data reveals the industry supports 34,000 jobs, a proportion of which are in areas of high unemployment, including at the coast. On 3 April 2017, Communities Secretary Sajid Javid announced that communities up and down the coast were to benefit from a £40m cash boost with projects being supported in order to create new jobs, attract tourists and boost economic growth. The economic contributions made by entrepreneurial amusements businesses are evident throughout the country and emanate from some sources which are left of field. Andrew Heighway, managing director at Merthyr based Heighway Pinball, felt that the time was right to have a new and innovate pinball machine which would convince operators to invest in the pinball market once more. The company spent three and a half years on a research and planning programme redesigning the pinball to make it more reliable, easy to service and profitable for operators. Britain’s first pinball manufacturer enjoyed a successful launch with its first game Full Throttle; this has been followed by Alien Pinball, launched 35-years after the opening of the movie it is based upon. The impact of a strong order book is the creation of jobs in a town where, according to ONS data, male unemployment stands at 8.8 percent, significantly above the figures for both Wales (5 percent) and Great Britain (5.1 percent). The economic modelling undertaken by PwC has also been deployed as evidence to support Bacta’s triennial submission. The economic case for the creation of a new category, B5, the numbers of which would be limited to 10 percent of a venue total, would result in an uplift in revenue of £117m, a total economic contribution of +£165m and a further increase in machine taxes payable to the exchequer of +£25m.